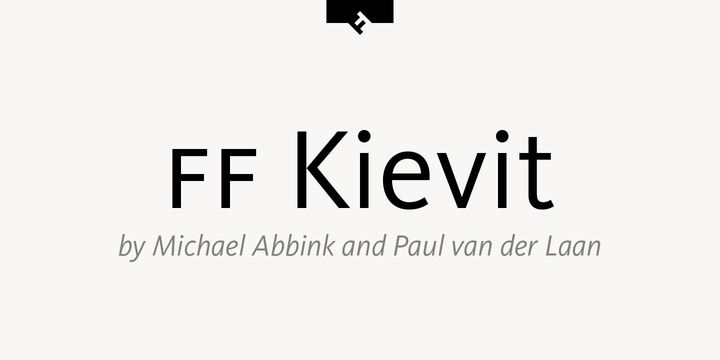 FF Kievit is sans serif typeface created by Michael Abbink and published by FontFont which comes in 2 widths each with 9 weights and italics, a wide range of OpenType features, subscript characters and a complete range of figure set options. Also it has multilingual support. It was designed to be suitable for typographical project, from advertising, book, packaging, branding, signage, text to screen design. FF Kievit received several awards in 2001…Cannot miss it! Note: Kevit is a trademark of Monotype GmbH registered in the U.S. Patent and Trademark Office and may be registered in certain other jurisdictions. FF ia a trademark of Monotype GmbH registered in the U.S. Pattent and Trademark Office and may be registered in certain other jurisdictions. A font description published on Wednesday, October 5th, 2016 in FontFont, Fonts, Michael Abbink by Alexandra that has 2,509 views.